Becky is a Certified Photogrammetrist and Certified Mapping Scientist with over 20 years of technical and managerial experience in the Geospatial/GIS mapping field. Her professional background includes serving as a Senior Program Director and Director of Marketing and Business Development for leading traditional mapping firms. She is adept in utilization of leading GIS mapping systems. She has extensive experience in LiDAR mapping design and implementation and was a contributing author to the 2012 ASPRS Manual of Airborne Topographic LiDAR. 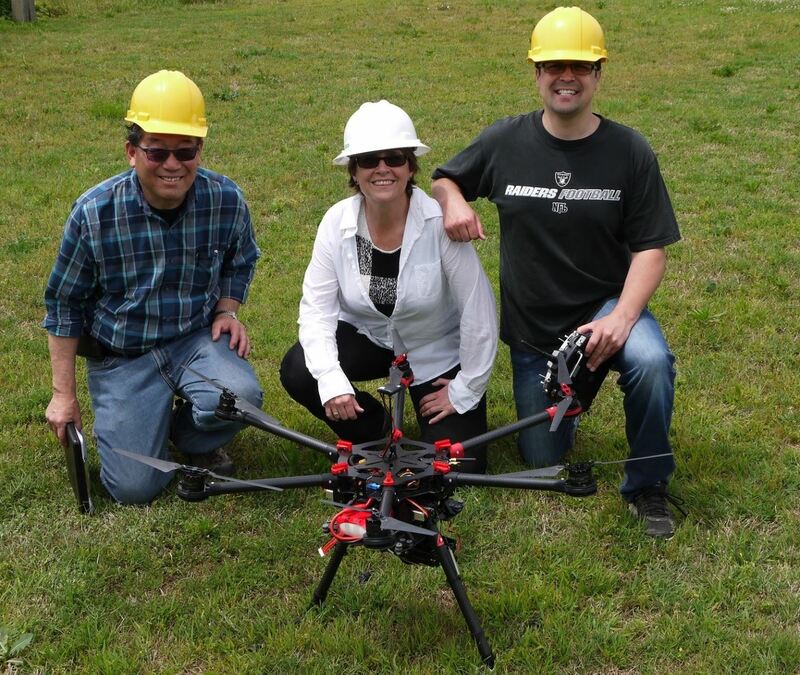 Becky serves in numerous roles within the American Society for Photogrammetry and Remote Sensing (ASPRS). Currently she serves as the national Vice President and recent positions have included Director of the Photogrammetric Applications Division, Director of the Professional Practice Division, and member of the Executive Committee. Q: You’re co-founder and the CEO of GeoWing Mapping Inc. What does your company do? A: GeoWing Mapping, Inc. (GeoWing) offers high-end mapping solutions incorporating unmanned aircraft system (UAS) (aka “drone”) mapping services. We focus on quality and accuracy using traditional data gathering means as well as new technologies, for example, use of remote sensing from 5-band multi-spectral cameras on a UAS. As a co-founder and majority owner of GeoWing, our company is woman-owned small-business qualified. Q: I’m fascinated by all your aerial toys. What’s your favorite UAV (unmanned aerial vehicle)? GeoWing founders Alan Mikuni, Becky Morton, and Jeffrey Miller, from left to right, with The Enterprise in the foreground. Photo credit: GeoWing Mapping Inc.
“The Enterprise” (named by GeoWing) is a hex-copter (it’s got six legs). It’s a workhorse and can carry a number of good quality cameras and sensors, including GPS/GNSS systems. The Enterprise is a good entry-level, stable platform at a good price, capable of carrying a number of sensors with moderate weight. It can handle up to 10 pounds of payload. We purchased our first UAV from AirGon who built “The Enterprise” from a DJI-S900 frame and equipped it into a metric-mapping system. Q: When did you first discover GIS and what got your career started? A: I came to GIS from computer programming. I got a job programming at a geospatial mapping firm, specifically to do photogrammetric data processing. I wrote translators for stereo plotting devices to translate data to various platforms like ArcINFO and AutoCAD. We purchased one of the first computer systems (a combination of hardware and software) for capturing and developing ortho-photography. I managed the production of those photos for this mapping company. The system was capable of auto-correlating the elevation and displacement to determine a DEM from the aerial photography, similar to today’s “structure for motion” (multi-ray photogrammetry) that produces very accurate positioning of pixels. Q: What’s the best application of a GIS map or tool you’ve used or seen someone else use? A: The best utilization of GIS that I have been personally involved with has been utilization of software to process LiDAR data to determine “danger trees” that are in close proximity to transmission lines. There are so many pieces of geospatial data that come together to derive intelligence about which vegetation presents a risk to transmission lines, such as the characteristics of the conductors, amount of current flowing through the lines, ambient temperature, wind speed and direction, and proximity of vegetation, that it makes for a challenging and informative GIS map data product. Q: Did you have any difficulties getting to where you are today? If so, how did you overcome them? A: Starting GeoWing in a Lean-Startup mode has been challenging. It’s taken a lot of discipline and money management. I’ve had to really focus on determining what we’re good at and focus on those markets without getting distracted. This year’s challenge has definitely been to stay focused and be proactive in developing our markets. I’ve learned to manage my time and money wisely. Q: As a woman, what challenges did you face in the field of GIS or aerial photography? A: Most women in any industry run across those times when we feel like we are in a male-dominated world, and we may feel undervalued because of our gender. In those cases, I just worked harder to be better so that I wouldn’t go unrecognized for my efforts. Q: What project have you worked on that you are most proud of? Portion of the project displayed as a Color-Infrared Orthophoto Mosaic captured with a 5-band multispectral camera on The Enterprise UAV. Photo credit: GeoWing Mapping Inc.
To date, our first GeoWing UAS project! We utilized a multi-spectral sensor on a marshland in the northern San Francisco Bay Area in California for a remediation study. GeoWing and its partners are working on special processing scripts to process UAS imagery collected in five distinct bands for vegetation analysis. The marshland project was flown in one day and 4-band orthophotography was delivered a few days later. This is the beauty of UAS photogrammetry and remote-sensing, in that high-resolution, high-accuracy data can be collected and delivered in a matter of days! Q: What map has made a difference in your life? 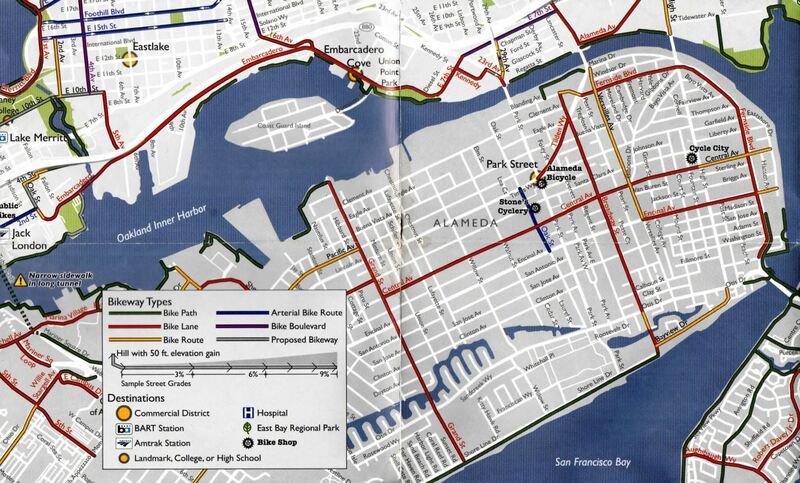 Photo of Becky Mortons well worn Oakland Bike Trails map. Photo credit: Beck Morton. A: The first thing that comes to mind is tourist maps – Paris, hiking trails, San Francisco, and bike routes in the East Bay. CA Geologic maps also helped me find the safest area to purchase my home in our earthquake-risky Bay Area – perhaps saving my life at some point in the near future! Q: In 25 words or less, give us your life’s motto. In the words of Maya Angelou, “My mission in life is not merely to survive, but to thrive; and to do so with some passion, some compassion, some humor, and some style”. Q: And finally, if you had a daughter following in your footsteps, what advice would you give her? A: My advice to my daughters would be to seek work that provides meaning and enrichment to their life and to the lives of others. One of my daughters currently works as a County Planner using GIS in a rural South Dakota County. She is also an officer in the Regional GIS/URISA professional organization. I hope that both of my daughters have learned that life is about what we contribute as well as the enjoyment that we personally experience. Interestingly, I have found that joy and fulfillment are intricately tied to doing something meaningful beyond our own self-interest. Interview conducted by Petronila Esther Mandeno of Digital Mapping Solutions exclusively for Women in GIS.